After a 60 year absence, trains may again be chungging into Malacca. KTM behad is conducting a feasibility study on restarting the former Tampin-Malacca link. Anohter study is on the Mentakab-Kuantan link. The Tampin-Malacca link ended in World War Two when the Japanese dug up the tracks and used them to build the Dealth Railway between Thailand and Mynmar. 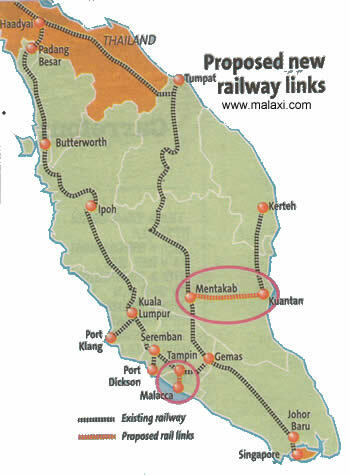 A rail link would benefit Malacca, providing the historical city with an alternative mode of trasport. Malacca doe not have a major port, the railway will serve passengers rather than freight.